This article, as it originally appeared in the New Haven Independent on September 8, 2014, can be viewed here. In this first installment of a three part series exploring where the Greater New Haven Region is now, how it got to where it is, and how it can imagine itself in the future, the author discusses the economic, social, and demographic character of the region as it exists today. Much of the supporting data for this first part of the series comes from the Greater New Haven Community Index 2013, a report published in September of 2013 by DataHaven, a non-profit organization dedicated to improving the region by compiling, interpreting, and sharing high-quality public information for effective decision-making. The report consists of various indicators, which provide a glimpse into the wellbeing of the region’s residents. 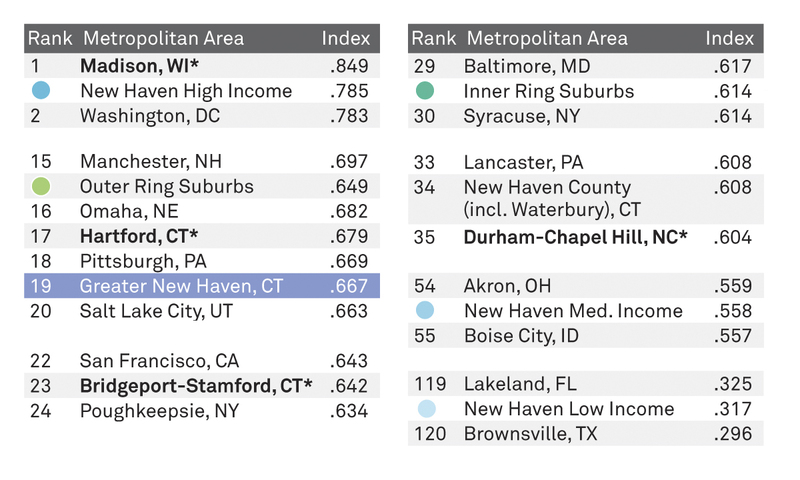 According to the Community Index Report, Greater New Haven, on the whole, enjoys a high quality of life – helping to make the region a desirable place to live. In terms of wellbeing (determined by the aggregate of a series of indicators, including employment, poverty, and commute times) Greater New Haven ranks within the top 15% of regions nationally. In areas like educational attainment, opportunities for youth, and access to health care, in particular, the region excels. While this is encouraging news, there are also several indicators, such as income inequality, school segregation, and housing costs that prevent Greater New Haven from performing even better. Of additional concern, these characteristics are not evenly distributed throughout the region, but vary drastically depending on location. Within Greater New Haven, each town plays a certain role according to its own unique characteristics. For analysis purposes, the Report categorizes the region’s cities and towns into three basic groups based on their common roles within Greater New Haven: the Outer Ring Suburbs, the Inner Ring Suburbs, and the Low, Medium, and High Income Areas in the City of New Haven. Determining the role that these groups play within the region will allow for a better understanding of what contributions are made to the overall success of Greater New Haven by each place. 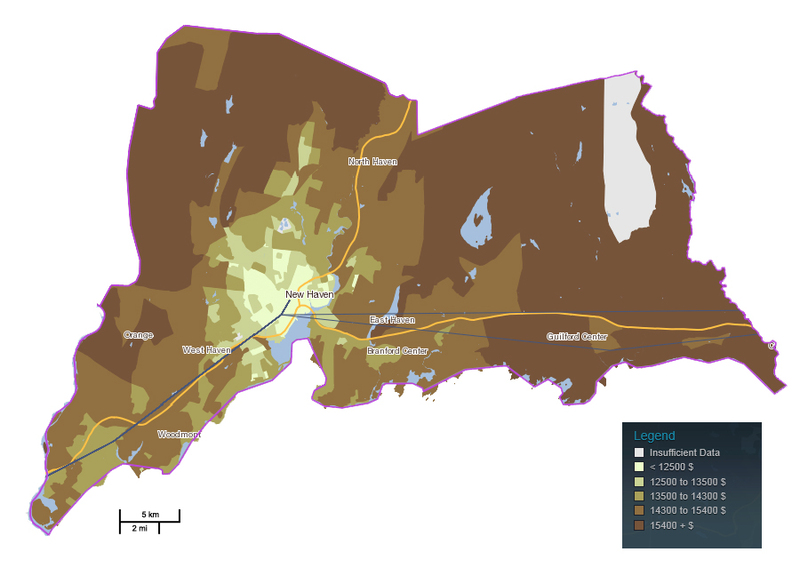 The Outer Ring Suburbs include the predominately ex-urban towns of Bethany, Branford, Guilford, Madison, Milford, North Branford, North Haven, Orange, and Woodbridge. Collectively, these towns rank slightly higher than the overall region on the Index of Wellbeing. The factor that most contributes to the high ranking of these towns is the housing of large numbers of high-income people while providing very few affordable units. 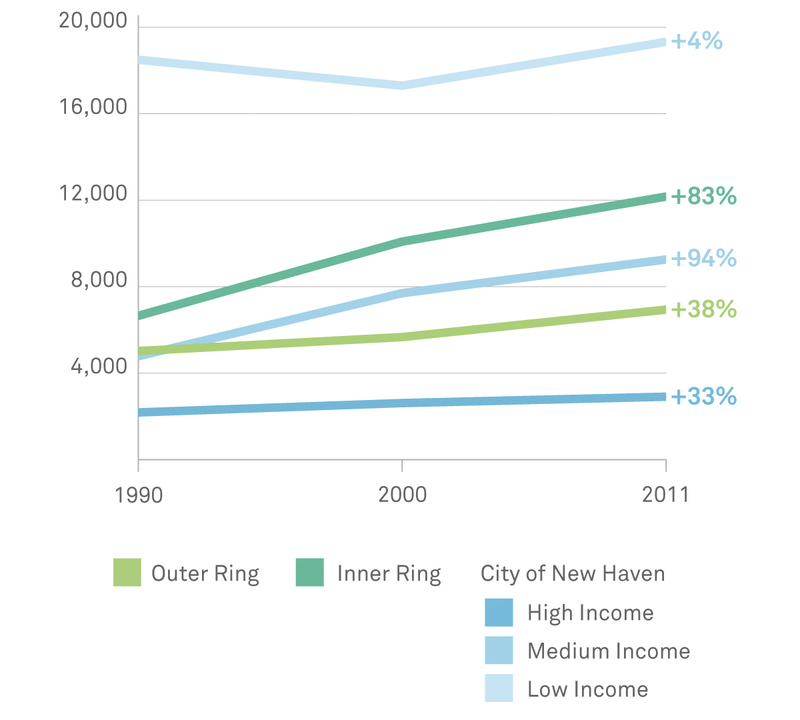 The Outer Ring Suburbs house 41% of Greater New Haven’s total population, but only 14% of its low-income population. As a result, these towns have a well-educated workforce and a solid tax base, yet have little demand to provide services, which allows residents to enjoy low unemployment rates, good student performance in schools, low poverty rates, good health, low crime, and relatively low taxes. While the Outer Ring Suburbs have benefited from these characteristics for several decades now, recent trends show that these towns may be losing favor among key demographics. Overall population growth has slowed significantly in the Outer Ring Suburbs over the last 10 years – netting just 4,000 residents since the year 2000. 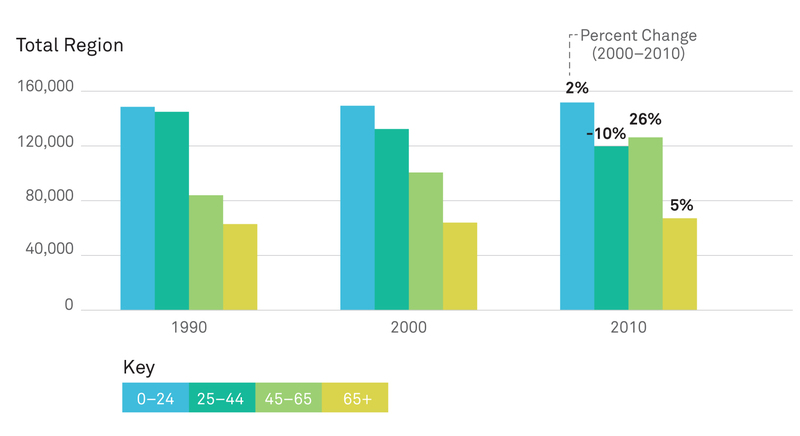 While gains in the population over the age of 45 have managed to outpace the sizable losses of young people under the age of 44, the absence of a growing youthful population does not bode well for the future of these towns. Furthermore, the Outer Ring Suburbs have experienced a net loss of over 4,000 jobs since 2002, and the few jobs these towns do have tend not to pay a living wage (defined as a job that pays at least $40,000 a year). The reality of having more workers than jobs and more non-living wage jobs than living wage ones is reconciled through commuting to other towns – predominately New Haven – for work. This, unfortunately, generates more traffic-inducing road usage, costly and voluminous parking infrastructure, and pollution. However positive the outcomes might be, continuing to house a disproportionate share of the region’s wealthiest households at the expense of losing young people and jobs not only puts the Outer Ring Suburbs on a downward trajectory, but also the Greater New Haven Region as a whole. Comprised of the largely suburban towns of Hamden, East Haven, and West Haven, the Inner Ring Suburbs house a diverse cross-section of the region’s population. Traditionally, these towns benefited from low unemployment rates, good student performance in schools, low poverty rates, good health outcomes for residents, and relatively low crime and taxes. However, the Inner Ring Suburbs have also recently experienced a loss of residents in the 25-44 age range despite overall strong population growth with other demographics. Additionally, in the last decade these towns have seen a substantial loss in the number of jobs, of which there weren’t many to begin. Supplying just 19% of the region’s jobs while housing 31% of its population, residents of the Inner Ring Suburbs, like the Outer Ring, are able to rectify this through commuting. Despite good outcomes overall for residents and the fact that the Outer Ring also benefits from commuting, the Inner Ring Suburbs actually rank below the overall region on the Index of Wellbeing. This is largely due to ongoing demographic changes in recent years and the inability of these towns to adequately respond to these changes. The Inner Ring Suburbs have seen dramatic increases in poverty and crime, while providing the level of service associated with low taxes. New residents of these towns are often in search of better schools, greater opportunity, and a higher living standard. Unfortunately, they are being faced with the realities of suburban living, including the burdens of homeownership and multiple car-ownership, and these new groups tend not to have the means to support this lifestyle as more established residents of the Outer Ring Suburbs do. At the moment, the Inner Ring Suburbs are a microcosm of the entire Greater New Haven Region, but they are in the midst of dramatic change and without charting a different course, these towns will have a difficult future ahead of them. After decades of population loss and economic stagnation, the City of New Haven has seen impressive job and population growth in the last 10 years. For the time being, it appears that the city has begun to dig itself out of the hole it’s been in since the onset of deindustrialization. However, the city is still plagued by problems familiar to most American cities. New Haven houses just 28% of the region’s total population, but is home to 59% of its low-income residents, despite the fact that the city supplies over 79,000 jobs – nearly double the number of workers that live in the city. As is the case in the Greater New Haven Region, these issues are not distributed evenly throughout each neighborhood. Therefore, rather than looking at the city as a monolith, it is better understood by looking at its parts. The Low Income Areas of the city include Dixwell, Dwight, Fair Haven, the Hill, Newhallville, West River, and West Rock. During the industrial era, these neighborhoods were the working class areas of the city. Today, they are where a disproportionate share of the region’s low-income residents live and it is on these streets where one finds the majority of the city’s crime, unemployed population, abandoned buildings, vacant lots, residents in poor health, and underperforming students. This is the results of decades of divestment, marginalization, and misguided planning efforts. The decline of manufacturing jobs decimated working class neighborhoods in the city, producing a chronically unemployed underclass. Contributing to this is the fact that only 4% of the living wage jobs located in New Haven are held by workers living in the city’s Low Income Areas. Although 24% of workers living in these neighborhoods are able to find a living wage job outside the city, this leaves many workers to depend on a shrinking number of suburban jobs that do not pay a living wage. Not surprisingly, these Low Income Areas rank lowest on the Index of Wellbeing as compared to the other places in the region. For the most part, these neighborhoods have not seen the fruits of the City’s recent rejuvenation. That’s not to say that New Haven’s Low Income Areas are hopeless, to the contrary, they are home primarily to hardworking families and small businesses trying to succeed. Not only that, but these neighborhoods also have the infrastructure for success – from building lots already served by utilities and historic properties to transportation options and proximity to regional assets . The problems facing these Low Income Areas might be severe, but they are not insurmountable. The city’s Medium Income Areas contain the neighborhoods of Amity, the Annex, Beaver Hills, Downtown, Edgewood, Fair Haven Heights, Quinnipiac Meadows, and Wooster Square. These neighborhoods traditionally served as either stepping stones for working class families or middle class enclaves that have become more affordable over time. Home to diverse populations, these Medium Income Areas of the city have adjusted to changes with mixed results. Compared to the rest of the region, these neighborhoods rank just below the Inner Ring Suburbs on the Index of Wellbeing. This speaks to the struggle that these areas have faced trying to accommodate a disproportionate share of the region’s low-income residents, while maintaining homeownership rates and a solid middle class presence. Factors like crime, student performance, health, and unemployment reflect that struggle, resulting in overall performance that falls short of the region as a whole. However, with good infrastructure, a largely intact building fabric, and a stable middle class residency, the Middle Income Areas have solid foundations upon which to build a stronger future. The High Income Areas were the traditionally middle and upper class neighborhoods of East Rock, East Shore, Prospect Hill and Westville that managed to continue attracting investment over the decades despite the changes of the past century. Not only have these neighborhoods maintained their desirability, but they have also accommodated a diverse cross section of the region’s population. Like the Inner Ring Suburbs, the High Income Areas of the city appear to be a microcosm of Greater New Haven. Amazingly, these neighborhoods also rank highest overall on the Index of Wellbeing, while not having the social homogeneity that characterize the Outer Ring Suburbs. The presence of transportation options, access to regional resources, and a high quality housing stock has compensated for merely having high income households as the sole generator for good wellbeing. However, being located within the municipality that services the entire region has put a large tax burden on the High Income Areas of the city. The primary challenge facing these neighborhoods, therefore, is not what they can do internally, but what role they can play in ensuring that other places in the region become equally successful. 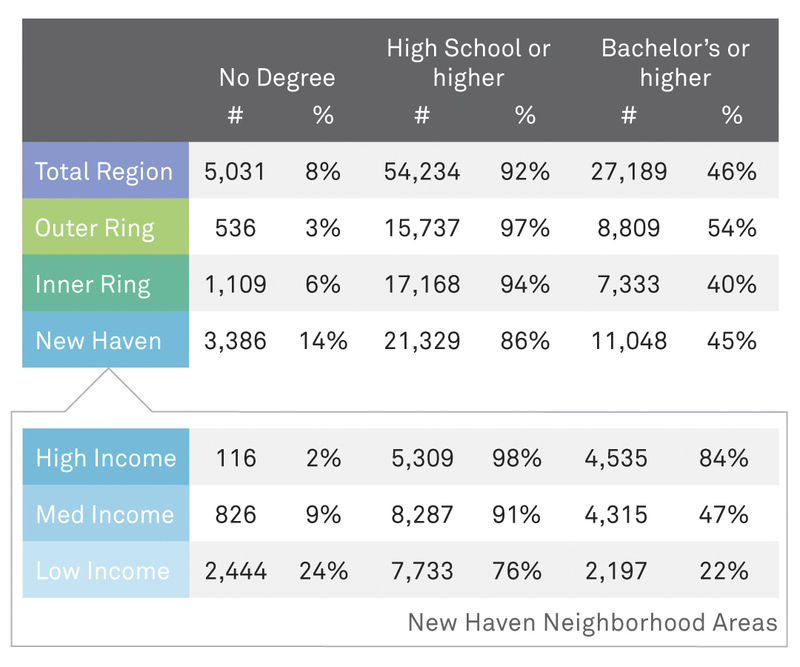 The Greater New Haven Region as a whole enjoys a high quality of life characterized by high incomes, educational attainment, opportunities for youth, and access to health care. However, these attributes, which have traditionally made the region attractive, are beginning to waiver. The population of 25-44 year olds, for instance, dropped by 10% between 2000 and 2010. The region has also seen a net decrease in jobs over the past decade. 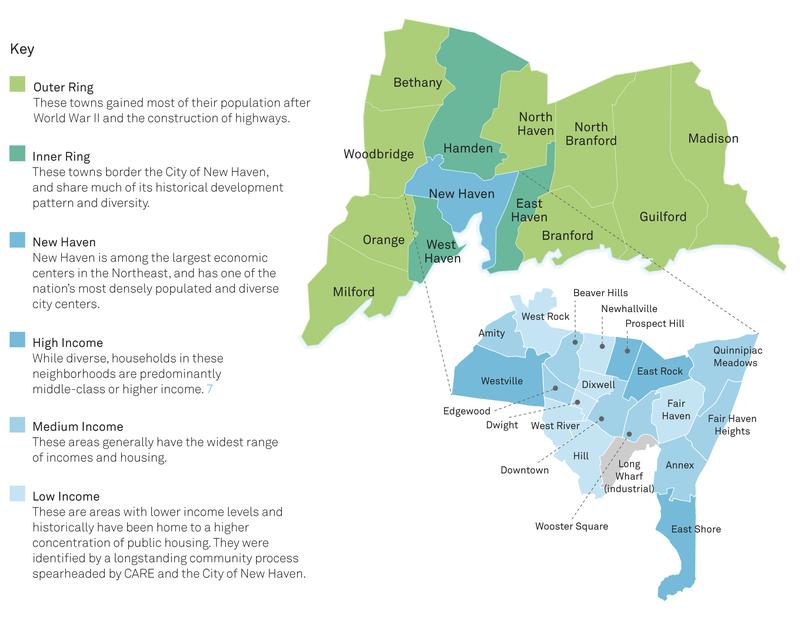 Underlying these issues is the distribution of roles between places in Greater New Haven, which thus far has resulted in creating a socially stratified region that is highly segregated based on one’s ability to access the various resources within the region. The Outer Ring Suburbs have been able to rely on a stable upper class population of successful households that require few services and achieve high outcomes for residents. However, these towns cannot serve as a model for the region because of high transportation costs, lack of housing diversity, and low-wage jobs, which prevent people who are not already successful from accessing them, thereby encouraging an exodus of the youth population and jobs. The Outer Ring Suburbs do not provide their share of jobs and housing for the region. The Inner Ring Suburbs are more inclusive of the region’s entire population and have performed well in producing good outcomes for residents, but they are also losing young working-age people and jobs. These towns have been unable to accommodate the rapid demographic changes taking place within their boundaries, leading to rising rates of poverty and crime – a recipe for becoming overwhelmed by service demand in the future. The Inner Ring Suburbs house a diverse population, but are not doing their part to provide economic opportunity for the region’s residents and are not prepared for ongoing demographic changes. The City of New Haven has been one of the only places in the State to show strong job growth over the last 10 years, which has gone along with its impressive population growth, specifically in the important 25-44 year old demographic. In fact, it’s been the city’s archaic zoning process that has been a principle obstacle in promoting faster growth to correlate with New Haven’s consistently low office and rental housing vacancy rates. While well-educated residents of the region have seen the benefits of the New Haven’s recent growth, many long-time city residents have been left out of this rejuvenation. 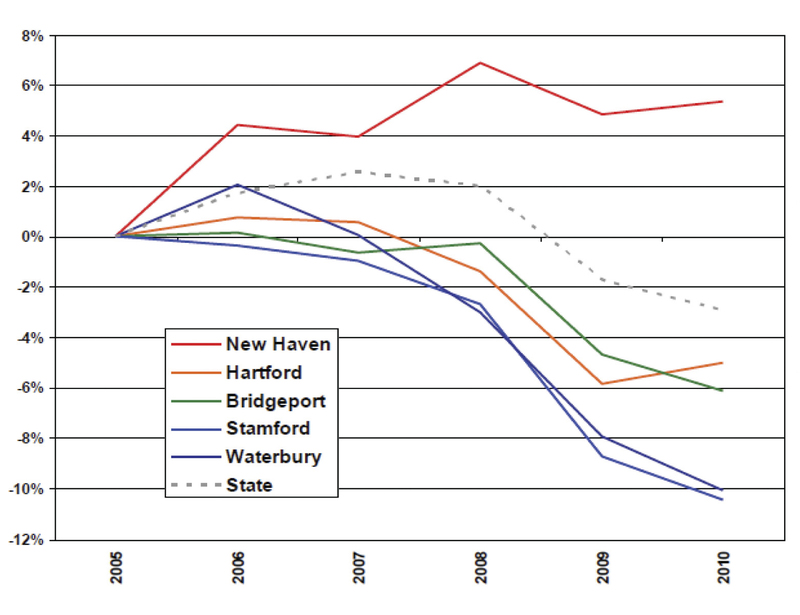 New Haven is burdened by having to house a majority of the region’s low-income population, supply regional services, and provide high-paying jobs for surrounding towns’ residents. New Haven’s Low Income Areas, in particular, have continued to struggle in the regional economy and attract investment to their neighborhoods. Fewer than 10% of workers from Low Income Areas walk or bicycle to their jobs, which speaks to the need for many residents to travel to suburbs for work where low-paying, entry level jobs can be found. Unfortunately, these jobs tend not to pay a living wage, thus burdening the City with demand for service provision in order to help compensate for the low wages. The role of these neighborhoods has been designated as the place for the region’s poorest residents, where success is achieved through adversity, not encouraged by design. Investment here is rare and any wealth created tends to leave for other places shortly thereafter. The Medium Income Areas fare a little better with nearly 20% of workers walking or biking to jobs and 40% of residents earning a living wage, but without lessening the burdens of servicing and housing a disproportionate share of the region’s poor, these neighborhoods will be unable to thrive. Based on analysis of the Report, it is New Haven’s High Income Areas, however, that have set a new standard for performance in the region. These neighborhoods, like the Inner Ring Suburbs, house a diverse cross-section of residents in proportion to Greater New Haven’s overall population. Yet, the residents in the High Income Areas of the city outperform any other place in the region, whether its academics, health, employment, or most other indicators. These neighborhoods have managed to promote both accessibility and achievement, largely as a result of transportation options, sustained investment, and good infrastructure like high quality housing, walkable streets, and active public spaces. 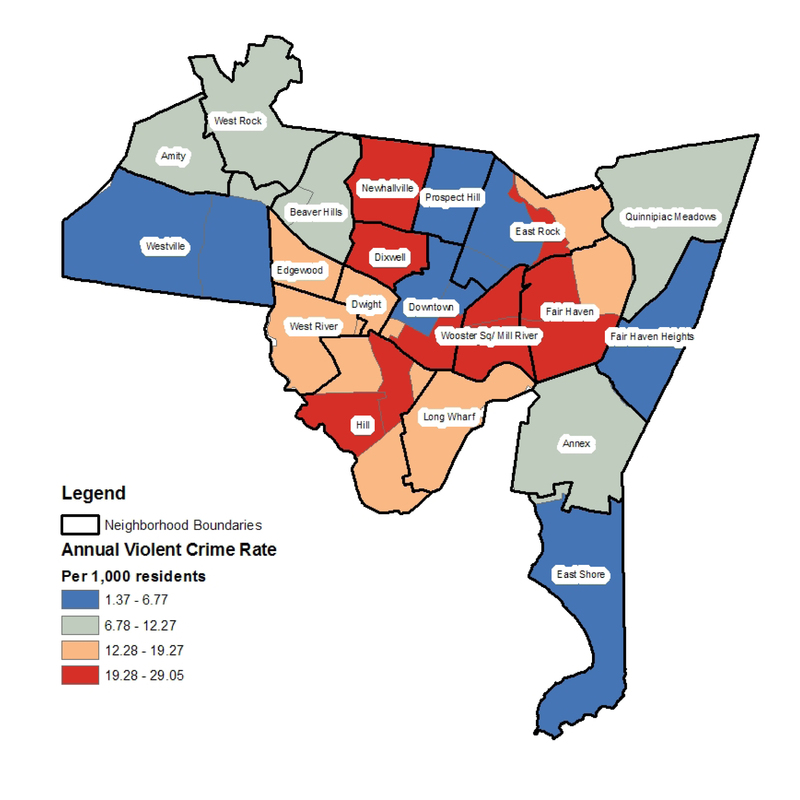 While Greater New Haven exhibits a clear socio-economic spatial hierarchy between places within the region, the city’s High Income Areas show that demographic homogeneity and exclusion are not required to achieve positive outcomes for residents and may actually lead to long-term decline. Apparently, the combination of access to resources, high quality infrastructure and housing diversity, not only enables social inclusion, but also produces the best indicators for wellbeing in the region. However, as housing costs, taxes, and desirability in these neighborhoods rises, they may become less affordable and more exclusive. The High Income Areas, therefore, cannot serve as the lone bastion for inclusion and success in a segregated region. In order to remain successful in the future, Greater New Haven needs more places that don’t sacrifice accessibility for wellbeing and more competition between these places.